March 14, 2015 is National Pi Day! No, silly, not PIE day, PI Day!! Pi Day also falls on the same day as Albert Einstein’s birthday. How great is that?! Pi Day does have some similar qualities to Pie Day though (and if there isn’t actually a Pie Day, there should be), in that many people like to encourage the eating of pie of any kind to help with the celebrating of the mathematical concept! To that end, my oldest daughter’s Algebra class will be celebrating Pi Day tomorrow with some sweet treats during class, so I said I’d send in a pie for them to use as part of their Pi Party. I had a single crust in the freezer and just enough ingredients to make the newest pie that I’ve fallen in love with this winter: a chocolate chip cookie pie. 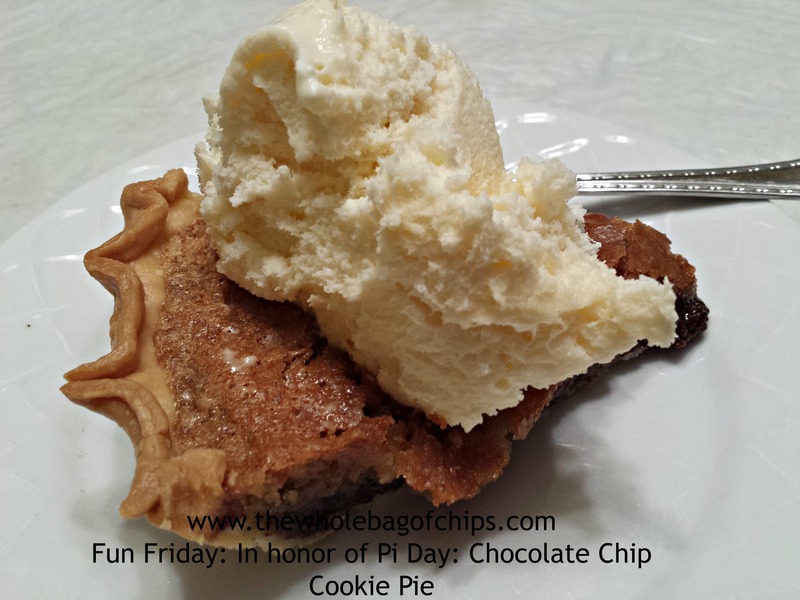 This pie recipe was sent to me by a friend during the first blizzard we had in January as one of 23 different Chocolate Chip Cookie recipes to try out. The list claims to be a life-changing experience. If this pie recipe is any indication, I’d say they’re right! This is a really quick pie to put together. Few ingredients, few steps. You don’t need to pre-bake your crust and the cook time is about an hour give or take, depending on your oven. The recipe is found on the Love from the Oven blog, and she has credited the original recipe to Nestle. Obviously I did not make the Pi Day pie and then eat it myself, so my photos here are from the second blizzard of 2015, when I made this pie for dessert one night. It was a keeper for sure, and that’s the only sad thing about sending away a pie for Pi Day….we got to smell it baking, but didn’t get to eat it! 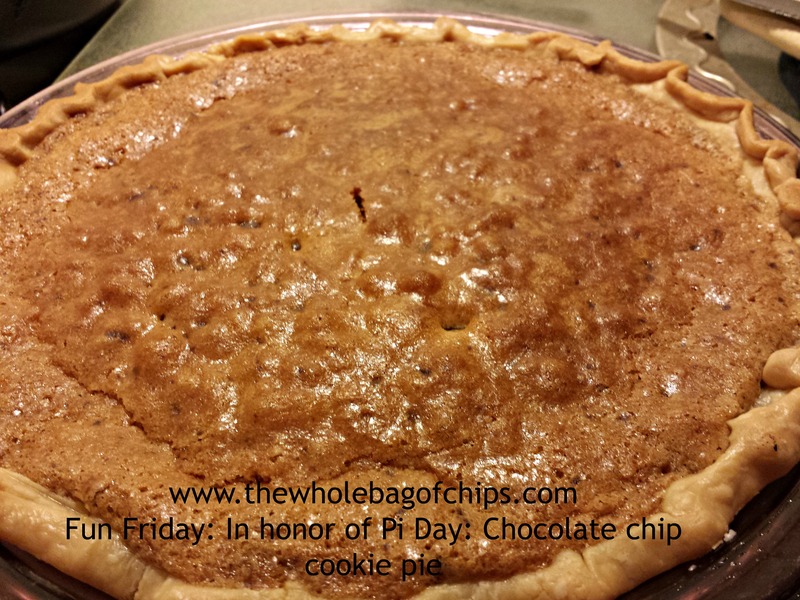 Quick, easy and perfect for Pi Day 2015! Beat eggs in a large mixer until foamy. Now add in flour and sugars. Beat until well blended. Beat in the softened butter. Stir in your chocolate chips and nuts. Stir and pour into unbaked pie crust. Bake at 325 for 50-55 minutes. Let cool before eating. Serve with ice cream or whipped cream (optional). ← Check out my work on SheKnows.com! How funny – I have one crust left in my fridge and was thinking of doing a chocolate chip cookie pie tomorrow, too. They’re delicious!